Welcome to Pavilion Bowls Club. THE GREEN IS CLOSED FOR WINTER. Go to Social Events. We are a fun and friendly club in Oxhey (south), Green Lane, WD19 4LU, up past the Pavilion Pub and Tennis courts. Pavilion Bowls Club is affiliated to: Bowls England, W&DBA, W&DLBA and Hertfordshire BA. Established in 1974 by local residents, so a young club in comparison to most around. We play through the summer months, May to September and have social events going on throughout the winter months. 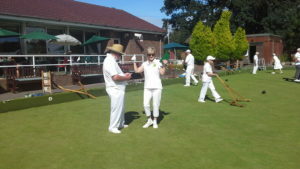 We meet and play with the local bowls clubs in the area of Hertfordshire. We are always happy to welcome new members, so whether you want to be social, are a novice who has never picked up a wood or you have played before you will be made welcome. So come try!